Glow in the dark cat · K-POPPED! 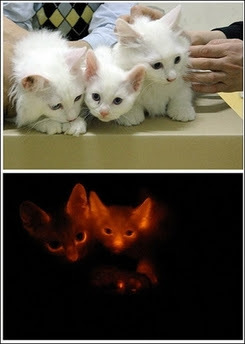 South Korean scientists have developed cats that glow in the dark! The scientists cloned Turkish Angora cats and have manipulated a fluorescent protein gene in the procedure developing a cat that glows a dull red when exposed to ultraviolet beams. It is said that this study could help develop treatments for genetic diseases in both humans and animals. Oh, all this science talk is making my head spin. I’m still stuck on the ethical part of the experiment! gosh… i prefer the normal cat..thank you..
Ladida…i did not catch that episode of Friends, where Ross’ teeth glowed in the dark. =) Sounds hilarious though! If the cats glow in the dark, then when you switch off all the lights at night, you will not accidentally step on your pet! poor kitties, but it’s for developing treatment for genetic diseases (cancers, autisms, diabetes, down syndrome, etc) o.O ..anywayz, hate to get off topic but have u guys ever watched “Friends”? This article reminds me of that one particular episode where Ross (David Schwimmer) bleaches his teeth for a date..the only problem is that they glow in the dark. It was so hilarious!! Oh no, poor kittens! I apologise for all mankind…we can be so daft sometimes.